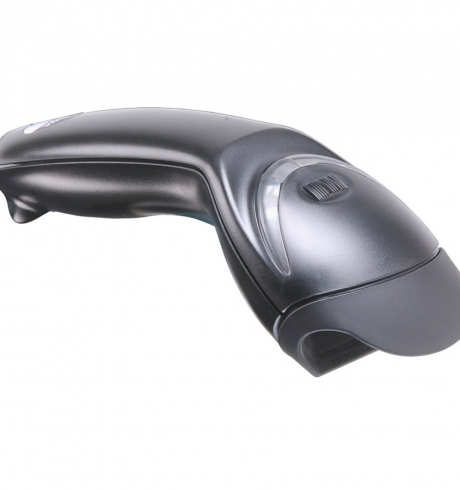 The Eclipse 5145 is a powerful single-line hand-held barcode scanner for all popular barcode types. A compact housing and a vast range of programming and connectivity options make it the perfect all-round scanner for many typical barcode applications. With its modern laser engine, the Eclipse 5145 has a larger scanning range and wider scan field than any other CCD scanner. It provides aggressive scanning at high rates and can even read high resolution or small barcodes without errors. This allows not only cash desk applications, but also for example at the jewellers’ shop, or for scanning tiny electronic components or mechanical elements. Its design and compact housing allow application even under the most undesirable conditions: repeated drops from 1.5 m onto concrete do not effect its reliability. A sealed housing protects it from air pollution and dust. The Eclipse 5145 has an operating temperature range from 0°C to 40°C, and thus covers the entire range of food logistics storage temperatures. The low weight of only 97 g makes it one of the lightest available hand-held scanners, and ergonomically improves daily operation efficiency. The optional CodeGate function first buffers all scanned data, and once the user presses the CodeGate button the scanned data is released and transferred to the computer. Ergonomically situated on top of the scanner’s housing, users conveniently press the button with their thumb. This feature is especially intended for very small barcodes, menu scanning or document scanning. The Eclipse 5145 has all necessary accessories included: the PowerLink cable can be changed according to the users’ needs. The included software »Data Parsing« processes scanned information individually and makes professional data integrationa a lot easier.